I will release the grey one asap. Scroll down this page for the medium sized Blue Totoro pattern. Please read over the instructions and important notes that will help you assemble the doll. 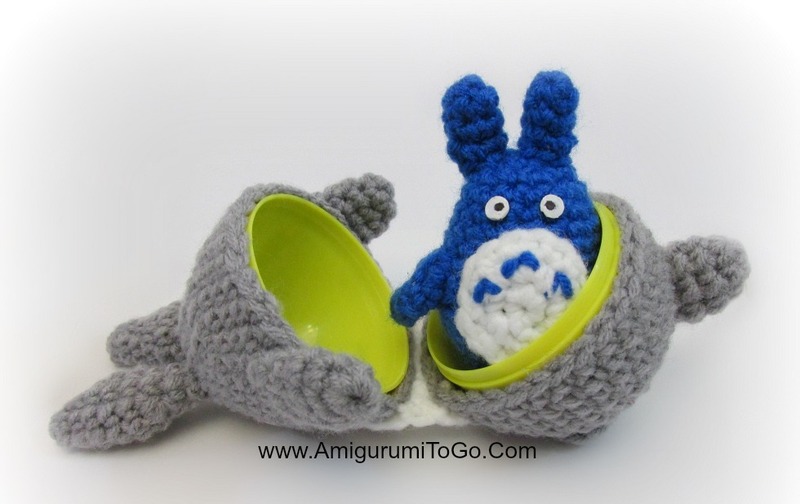 Please note if you'd prefer Totoro without the egg I do have a few patterns available including the Cat bus. Use the search bar in the upper right corner of this blog. I used green as I went through this pattern. You can use any color you'd like. The one from the original story is blue. these are optional but will help your doll stand. With no feet it rolls over. 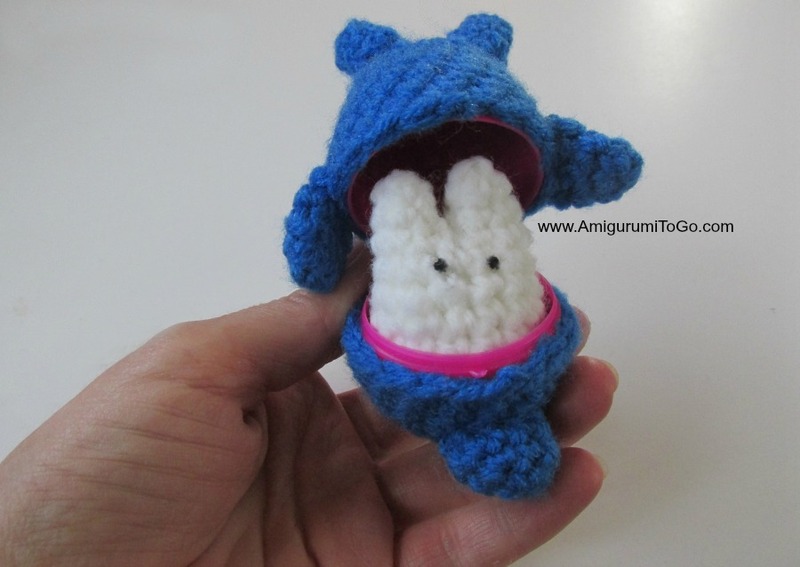 1) magic circle or adjustable loop with 5st and f/o leaving a short tail for sewing. You will have 4 yarn tails, just hide them inside the body when you're done sewing. 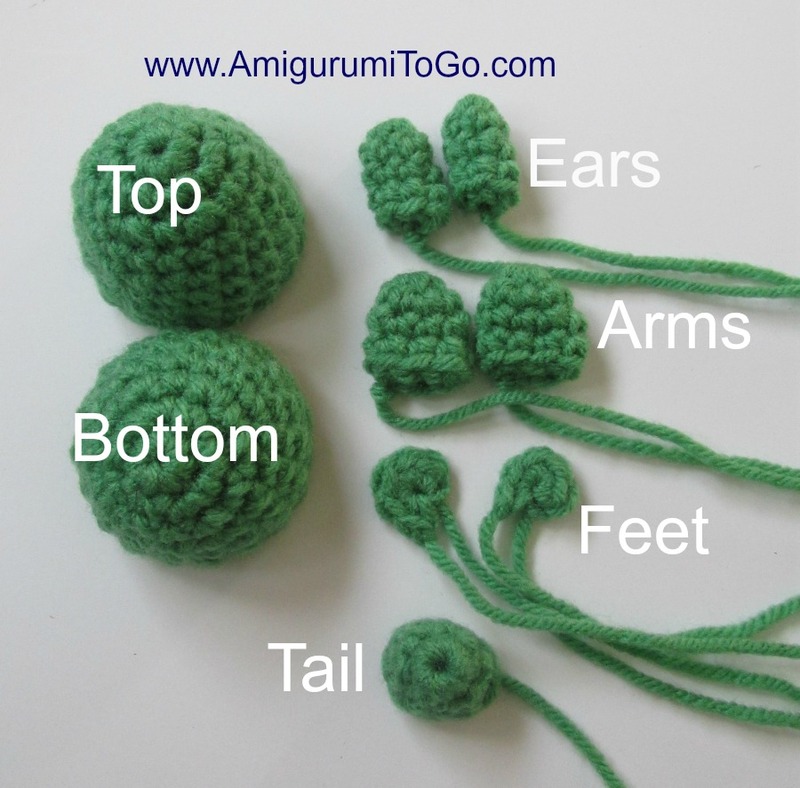 Note: For a slightly lighter weight yarn you might need to add more rows after row 8. 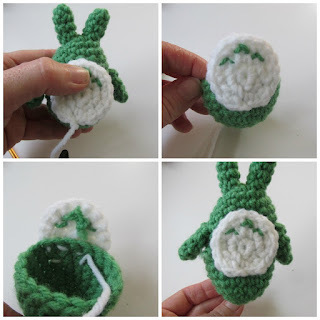 Place the the egg inside the body when you have finished row 8. If the bottom edge of row 8 reaches the edge of the egg then you can stop. you might have to stretch it a bit for it to reach. 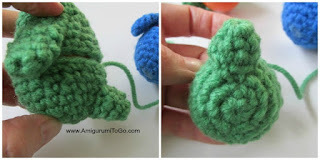 2) sew the arms onto the top half of body in line with the ears. The top edge of the arms should be sitting on the 2nd last row of the top half. 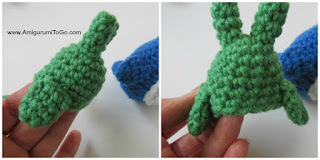 3) Sew the tail onto the bottom half. The tail should be sitting over top the 3rd, 4th and 5th row. 4) Sew the tummy patch on. Put the top half and bottom half of the body together, place the patch over, make sure everything is centered and the tail is right in the middle of the backside. Remove the top half now and hold the patch in place over the bottom half while you sew it to the body. Once the bottom of the patch is sewn in then place the top half of the body back on and continue sewing. Make sure the top and bottom half edges are snug, you don't want any gaps. This part can be a bit tricky so take your time. It's not hard just awkward to hold while sewing. 5) sew or glue the feet on. I sewed the feet sides together before sewing them to the doll. Place the egg inside just so it fills out the body so you know exactly where the feet should go. 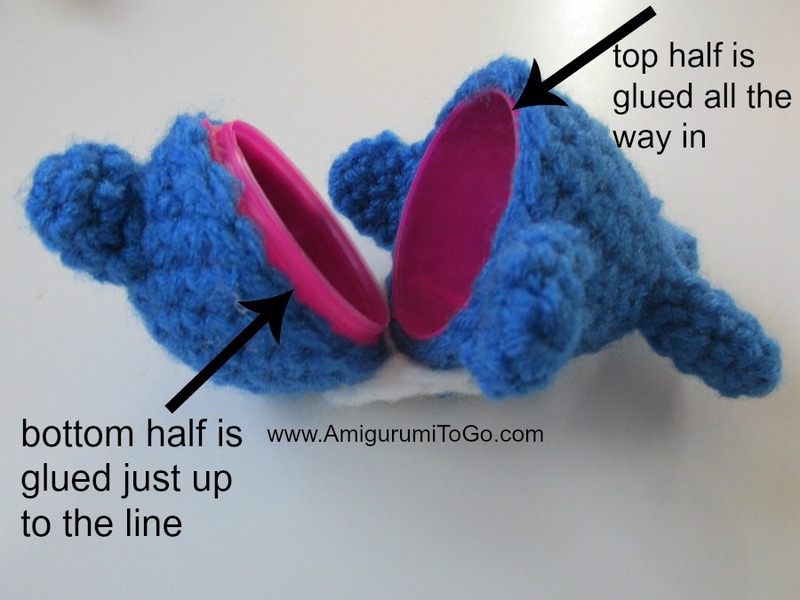 If you have all the parts centered then the feet should go right in front of the loop you started the bottom half of the body with. If it's all a little off center, no worries just do your best to center the feet so the dolls stands straight up. 6) add the eyes now. 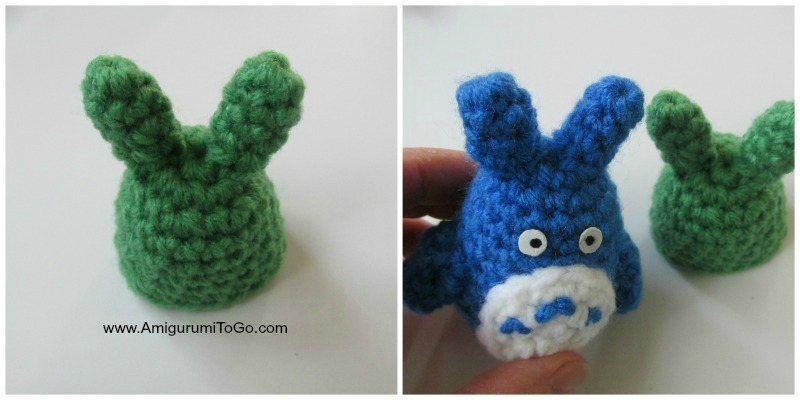 You can use anything you'd like for eyes such as felt, plastic, paint, buttons. I used 2 rubbery pieces that I cut into round shapes and painted. I then glued them in place one row above the top edge of the tummy patch. Use a tiny amount of hot glue or fabric glue. Be careful not to use so much glue that it oozes out onto the doll. 7) Glue the top half of egg in. 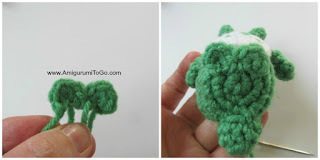 Do not have any glue puddles or the glue will seep through the yarn and be visible. 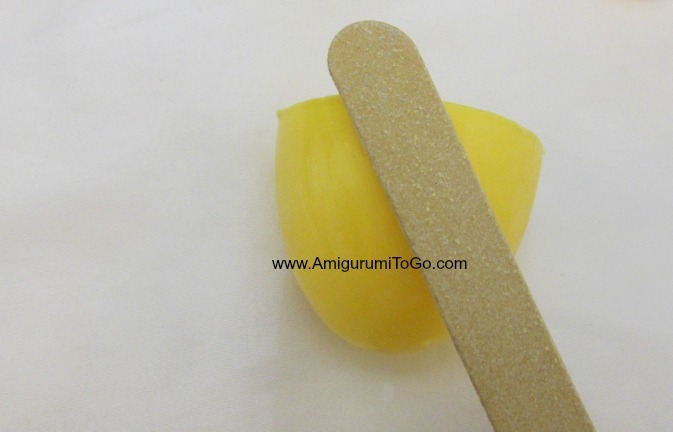 Instead spread the glue around evenly, making sure to also get the glue right around the edge but not over the edge. The top half should go all the way inside the body. 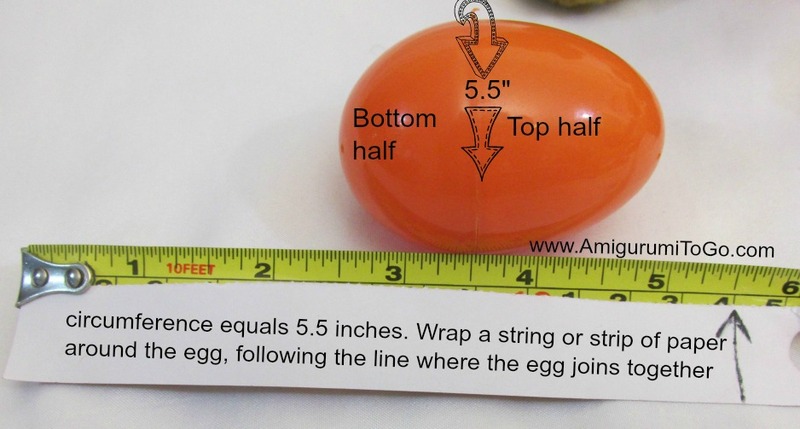 You might have to stretch the body a bit to ensure that the bottom edge is completely in line with the top edge of the egg. 8) Glue the bottom half of the egg in. The bottom half of the egg has a ridge, make sure this ridge is completely visible as pictured below and the crochet edge is below that ridge line or the egg will not close properly. Test the egg first to see how it opens and closes. 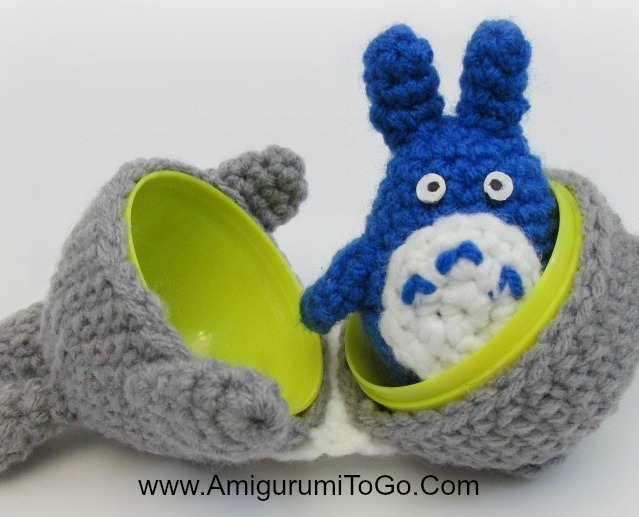 Come back soon for the final pattern in this set, the larger Grey Totoro. Hello, I love your idea of using Totoro for the egg. Can I ask you which kind of egg did you use? Thank you for sharing and congratulations!! They are plastic Easter eggs. the measurements are in the pattern. Thank you so much for the pattern!! !